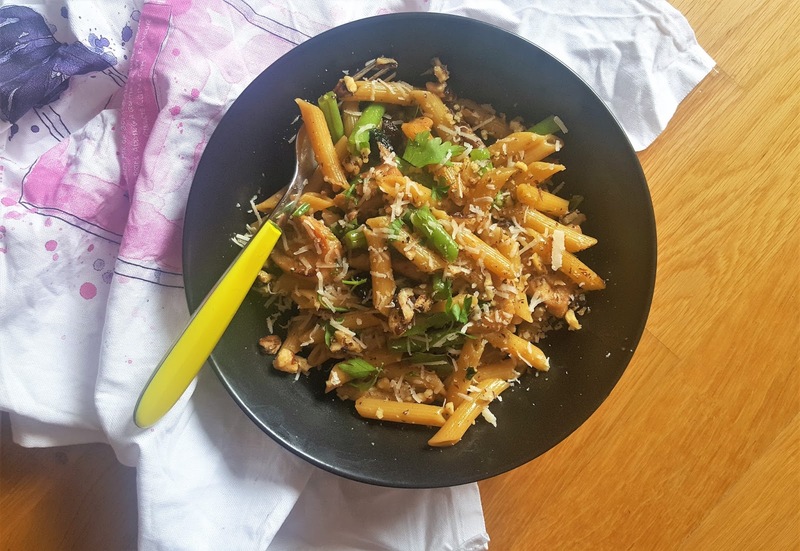 despite the utter failure of the last recipe post i wrote (thanks to those seven of you who read it), and purely based on the fact that i actually got to hang out in hello fresh's headquarters in shoreditch last week, i thought i'd try again. especially as after the epic spice masterclass with sabrina ghayour at the event, and the walls liiiiiined with inspiring cookbooks from all over the world in the "offices", i'm keen to get trying some more spicy combos of my own! sabrina's advice is to literally just experiment with any spice you like, and see how it goes. i basically live by that motto anyway; seeing as i can't eat onion i just experiment with other flavours when i cook, so her advice was right up my alley. she made some super tasty middle eastern cucumber bites for us to eat while she was demo-ing - literally just sliced cucumber with cumin and chilli and a whoooole bunch of other sneeze-worthy spices, and voila! one simple side, or starter for a heavier meal, and one that i'll definitely be whipping up again soon. the advice to experiment with spices isn't just limited to food. cocktail master dav eames from the gilbert scott was on hand, showing us how to use out-of-the-ordinary spices and herbs in our drinks as well. burning sticks of cinnamon and mint leaves with a lighter gave off the most incredible smells, a smell that dav says was inspired by "getting lost in the souks of marrakesh". having been there, and gotten lost there, and needing a strong cocktail after getting out of there, i totally follow this train of thought. needless to say, his spicy concoctions also went down a reaaaaal treat. i'm now signed up to another trial of the hello fresh box service, and so far: nothing spicy to experiment with! but, i do have a new favourite recipe - keep reading for all the details! put a large saucepan of water with a good pinch of salt on to boil for the pasta. halve, peel and chop the shallot into roughly ½cm pieces. peel and grate the garlic (or use a garlic press). trim the tops off the green beans and chop them into three pieces. roughly chop the walnuts and the parsley (stalks and all!). coarsely grate the parmesan. chop the chicken into 2cm pieces. heat a glug of oil in a frying pan on medium-high heat. add the chicken and season it with salt and black pepper. cook for 4 mins. turn the heat down to medium. stir in the raisins and honey. cook until the chicken is browned and caramelised, another 2-3 mins. take off the heat and remove the chicken and raisins to a bowl. keep the pan - we'll use it later! meanwhile, add the penne to the pan of boiling water. cook for 3 mins. add the green beans and cook 4 mins more until both are 'al dente'. once cooked, drain the pasta and beans in a colander but reserve the cooking water. pop them back in the pan and drizzle with a little olive oil to stop them sticking together. put the (now empty) frying pan back on medium heat and add the butter. when it has melted, add the shallot. cook for 5 mins. then add the garlic and three-quarters of the parsley. cook for 1 minute more. add the chicken stock pot. pour in 100ml of the reserved pasta cooking water and stir together. continue cooking the sauce for 3-4 mins. add back the chicken and raisins and cook for 3 more mins, or until the chicken is piping hot. turn off the heat and stir through the crème fraîche. combine your sauce with the pasta and beans and stir everything together. serve the pasta in bowls, sprinkled with the remaining parsley, the parmesan and the walnuts. enjoy!